Video clip synopsis – Lois O’Donoghue was born in 1932 in a remote Aboriginal community. She never knew her white father and, at the age of two, was taken away from her mother, who she was not to see for 33 years. Broadband MP4 odonrem_bb.mp4 (4.4MB), suitable for iPods and computer downloads. 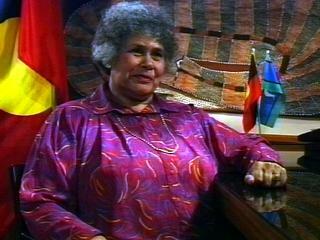 Lowitja O’Donoghue:The Stolen Generation is an excerpt from the program Lowitja O’Donoghue (26 mins), an episode of Australian Biography Series 3 (7×26 mins), produced in 1994. Lowitja O’Donoghue: Lois O’Donoghue was born in 1932 in a remote Aboriginal community. She never knew her white father and, at the age of two, was taken away from her mother, who she was not to see for 33 years. After a long struggle to win admission to a training hospital, Lois became the first black nurse in South Australia. In 1976, she was the first Aboriginal woman to be awarded an Order of Australia. In 1983 she was honoured with a CBE and in 1984 she was made Australian of the Year. In 1990 she became the founding chairperson of the Aboriginal and Torres Strait Islander Commission. Since this Australian Biography interview, she has changed her name to Lowitja O’Donoghue. Australian Biography Series 3: The Australian Biography series profiles some of the most extraordinary Australians of our time. Many have had a major impact on the nation’s cultural, political and social life. All are remarkable and inspiring people who have reached a stage in their lives where they can look back and reflect. Through revealing in-depth interviews, they share their stories – of beginnings and challenges, landmarks and turning points. In so doing, they provide us with an invaluable archival record and a unique perspective on the roads we, as a country, have travelled. Australian Biography Series 3 is a Film Australia National Interest Program. Lowitja O’Donoghue was one of many Indigenous children separated from their families. The first removals took place during the early period of European settlement. Indigenous children were separated from their families for use as cheap labour on farms and inland stations, and as domestics. In 1869, the first Aborigines Protection Act was passed in Victoria, with other Australian colonies following. This was the first formal government policy authorising the separations. The laws sought to protect Indigenous people from the effects of colonisation and settlement, and did so through segregation (by creating reserves and relocating Indigenous communities) and education of the young. 'Protectors’ were appointed and given significant control over the lives of Indigenous people. This was especially the case with their children, who were placed under the protector’s legal guardianship. This sweeping change of guardianship took place without consultation with Indigenous people. By the early 1900s, although the full-descent Indigenous population was in decline, the mixed-descent population was increasing. Policies soon focused more on merging (assimilating) this mixed-descent population into the non-Indigenous community. Indigenous young people were sent to schools that would prepare them for absorption into non-Indigenous society as adults. In the 1940s, a uniform set of child welfare laws was introduced and applied to Indigenous and non-Indigenous children alike. Children could only be removed if they were found to be ‘neglected’, ‘destitute’ or ‘uncontrollable’. Despite their equal application, the laws did little to reduce the number of Indigenous children removed. From the 1970s, governments gradually moved away from promoting assimilation and towards policies of self-determination and participation. In 1997, the Human Rights and Equal Opportunity Commission conducted a formal independent inquiry—the National Inquiry into the Separation of Aboriginal and Torres Strait Islander Children from their Families. Think about your whole name. Does your name indicate that you belong to a certain community? What information can a stranger read immediately just by looking at your name? Could a stranger be deceived by your name? If you could, to what would you change your name, and what would this new name show about your personality and your sense of belonging? Why do you think that Lowitja changed her name from ‘Lois’? Why do you think she kept the surname ‘O’Donoghue’? List the objects in the background behind Lowitja. What impression of belonging do these objects create? Lowitja refers to ‘the missionaries’ often and does not give them personal names. Her parents’ names are both mentioned. What response does this prompt from the audience? What does this show about Lowitja’s sense of belonging? Why does the director choose to change to a close up? Think about the term ‘half-caste’. In your opinion, in what ways would the label ‘half-caste’ affect an individual’s sense of belonging? Lowitja refers to north-west South Australia and indicates a name change. What does this change of name indicate about Lowitja’s sense of belonging? Compose a dialogue between a missionary and a member of the Stolen Generations. Consider the idea of belonging from both points of view. You must use the following words and phrases in your response: belonging, identity, outsider and part of the community.